Hooke’s 10-foot Mural Quadrant was the first of the Mural Instruments to be housed at Greenwich. It was designed by him for Flamsteed. Mounted on a wall in the plane of the meridian, it consisted of a graduated quadrant of 10-foot radius fitted with a telescopic sight. Used in conjunction with an accurate pendulum clock, it should have allowed Flamsteed to find the right ascension and declination of a Heavenly Body by measuring its zenith distance as it crossed the meridian, together with the sidereal time at which this happened. The instrument was set up in a specially designed Quadrant House at the bottom of the Observatory garden, where it was mounted on the east wall facing south. Flamsteed was not, according to him, consulted on the instrument’s design and Hooke ended up producing an instrument that he regarded as unusable. After spending considerable time and effort trying to make the Quadrant work, Flamsteed abandoned it. No longer in existence, its date of removal from the Observatory is unknown. It appears to have been removed prior to the Board of Visitors’ first visitation in 1713 (RS DM5/47 / RGO6/21/11, – click here for transcript). When Flamsteed last mentioned the Quadrant in his correspondence (in a letter to Edward Sherburne dated 12 July 1682), he made no indication of its whereabouts. 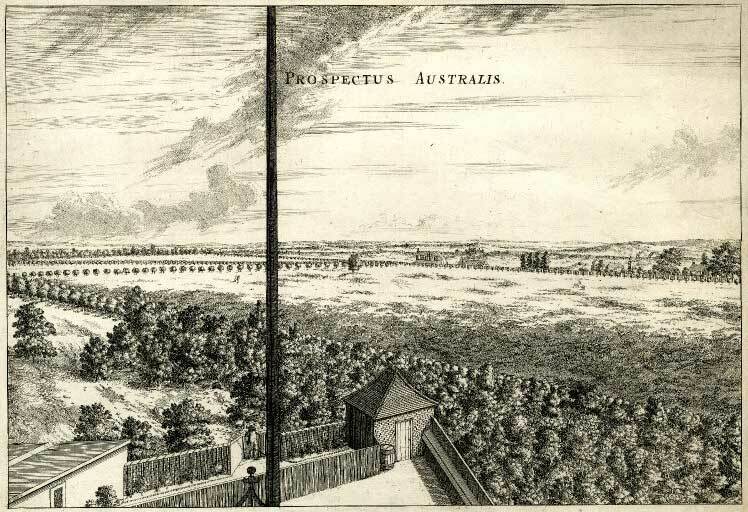 Although relatively little was written about the Quadrant, a visual record survives in the above etching by Francis Place (from a drawing by Robert Thacker) that was produced for publication in Flamsteed’s Historia Coelestis; together with a further plate that shows further details of the counterbalance and eyepiece. Although Flamsteed probably once intended to publish a description of the instrument (the main etching is annotated A–E), this was never done. The main limb consisted of a graduated scale divided into 18 divisions of each of 5º which were marked with a stud (these are visible in the etching). Rather than subdivide the scale further, a graduated subsidiary arc of length 5º, (D in the etching), was attached to a moveable frame at the eye-end of the telescope tube. In use the subsidiary arc (with the telescope attached), was moved along the main limb until its zero was opposite one of the studs. It was then clamped in position. 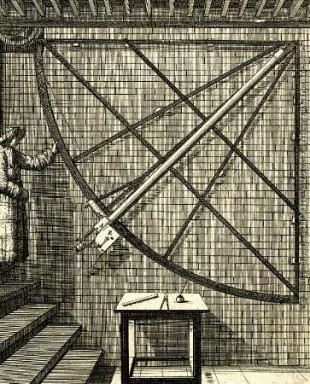 The horizontal crosswire of the telescope was then adjusted to centre on the object being observed by turning the crank (E). This moved the telescope up or down relative to the subsidary arc. Its position was read off on the subsidary scale and added onto the reading (a multiple of 5º) from the main scale. In an attempt to counterbalance the weigh of the telescope, a weight was attached to one end of a wire of rope that ran over a pulley (which can be seen top left), the other end being attached to the supporting framework of the subsidiary arc. The following extract is taken from Flamsteed’s History in his own life as published in Baily’s Flamsteed p.46. It was requisite that I should have first been furnished with one or more large wall quadrants, fixed in the meridian, for taking the meridional distances of the sun and stars from the vertex; which I was also promised. But, considering that the sextant would be the much more chargeable instrument, it was resolved that should be first begun: and, when it was finished, the workman demanding an unreasonable rate for his work, my friends were afraid I would contrive the quadrant as costly as the sextant. In the mean time Mr. Hook[e] boasts how large and precise an instrument he would make at a small charge: whereupon Sir Jonas Moore allows him the contrivance of it. He ordered it to be made: but with so little circumspection, that the limb was two inches less than a quadrant; and the double indexes so weighty and unmanageable, that they could never be conveniently counterpoised. So that Sir Jonas was sensible of his fault; and that this was an instrument wholly useless; though Mr. Hook[e] affirmed, with his usual confidence, it was well made. But I would not make it (what I could not) useful. I was much concerned at this mishap, and endeavoured what I could to remedy it: but found all my pains bestowed in vain, by reason of the great weight of the double index, and ill contrivance of the limb. I complained often of my want of this instrument: but found still all my complaints were insignificant in those ticklish times; and therefore to remedy it began to think how I might obtain some meridional heights by the sextant: which I soon found a way how to fix in the meridian; and, by a particular contrivance, whether it altered its position whilst I moved the index from one star to take another. Permit me, Sir, one free line. I have often tried to make Mr. Hook[e]’s wall-quadrant give me altitudes, and it has as often deceived me, and lost its rectification. I tore my hands by it, and had like to have deprived Cuthbert of his fingers. Except something more manageable may be put in its place, it will be a great let to our proceedings, as I shall further inform you when I see you. Flamsteed, John. The Correspondence of John Flamsteed, the First Astronomer Royal. Vol. one: 1666-1682. Vol. two: 1682-1703. Vol. three: 1703-1719. [3 Vols.]. Compiled and ed. By Eric G. Forbes, Lesley Murdin and Frances Willmoth. Volume one: 1666-1682 . Volume two: 1682-1703. Volume three: 1703-1719.